Home Job Tips Computer Related - Toughest HR Interview Question Recently Asked | What made you become interested in Computer field? Computer Related - Toughest HR Interview Question Recently Asked | What made you become interested in Computer field? The interviewer is making efforts to understand your underlying motivations for selecting this field as your profession. This hiring manager throws this question especially for entry-level positions, to learn how much planning and thought actually went into your career selection. The way you reply to this question explains the interviewer how dedicated candidate you are in giving the best performance to the company after receiving the job offer. You need to think about all of the factors which influenced your decision in choosing this career. So what are the points to emphasize on your answer. - Focus on the basic interest in the core responsibility of this career. - Highlight your relevant skills and character traits. - The scope of the profession. - Emphasize your interest in both stability and growth. - Let your interviewer know that you consider this offer as a stable job. - Do not let them feel that the position is just your back up option. Alternatives Questions: This is 2017, So interviewer is smart enough to ask the same question in different formats / ways. So what are some of the alternatives questions, depicting the same topic? Why did you decide to become a ... ? Why did you choose this career/job? Why do you want to become a ... ? Why did you take up this profession? Sample Answer: There were many influences that went into my decision to select this career field. I have grown up around computers and ever since I can remember I have been fascinated with learning how to squeeze more and more out of them. The ability to organize information, breaking problems down into modules and building upon them lead me to get interested in this field. 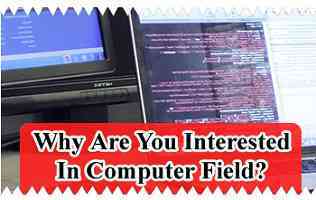 Moreover, the scope of computer field has no geographical boundary and is not limited to a single country. For me, Computer is like the universe and i believe my skills towards this profession will always help me to connect the world, no mater if I am in Mars.